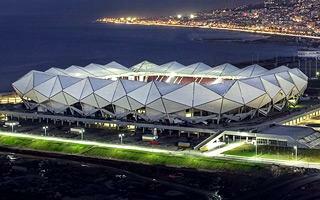 Turkey: Trabzonspor’s stadium ready in two weeks? First deadline for the new Trabzonspor stadium passed last year and even in early 2016 the pace didn’t seem too fast. Now it’s finally as good as fans might want. Yesterday the field was laid, while the very last seats await installation. Trabzonspor is already selling season tickets, even though they’re yet to see the stadium transferred into their hands. It should be any day now because works are ongoing fast and it’s highly likely that the first game will be played on November 21, against Antalyaspor. It would be beautiful, but even if not, official opening ceremony is scheduled for December 18, a week before big firm Fenerbahce comes to town (26/12). although “to town” might be a bit off, the stadium is actually located just west of Trabzon, beyond city limits, on land reclaimed from the Black Sea in 2013. Progress inside and outside can now be seen on a daily basis and so it should if the stadium is to be operable by year end. Last temporary roof supports are waiting to be removed as outer membrane installation is ending. Recently a small portion of 86 seats were removed from the stands. Why? Just look at the photo below and you’ll know: severely obstructed views for fans sitting directly behind the vomitories. For this reason the exact and updated capacity of the stadium now stands at 41,453. Of that number 38,001 seats are regular, 2,954 business and 196 in the lodge of honor. Nicknamed Akyazi Stadi, the stadium offers 122 private boxes and three business clubs (2 regular and 1 premium). Commercialisation of the hospitality areas is going well, according to club manager for the stadium. Gökhan Saral says regular season tickets are actually not selling too well, though he didn’t give a specific number (25,000 was the goal). Though the season is only 9 rounds in at this point, Trabzonspor won only three games, which is where Saral sees lack of excitement with season tickets. Surely the new stadium should prove a magnet for fans, even if it’s quite distant from the city centre. For the first time Trabzonspor fans will watch games in a true football-specific stadium, where the front row is just 8.5m from the field (10m behind goals) and steep, covered stands offer very good sightlines.